Hi friends, in this article, I am going to discuss about moving coil instrument working principle and other related information. You will appreciate my effort, I hope so. The simple view of construction of moving coil instrument is shown in the figure. It consists of a powerful permanent shoe magnet. A light rectangular coil of many turns of fine wire is wound on a light aluminum former. An iron core is inserted inside the coil to reduce reluctance for the magnetic lines of force. The coil is mounted on the spindle and acts as the moving element. Two phosphor bronze spiral hairsprings are attached to the spindle. The springs provide the controlling torque as well as they act as incoming and outgoing leads for the current. Eddy current damping is provided by the aluminum former. The basic moving coil instrument working principle is that when a current carrying conductor is placed in a magnetic field, a mechanical force is exerted on the conductor. The basic principle can also be stated that when a field resultant magnetic field (produced by the movable current carrying coil) tries to come in line with the main field (produced by the permanent magnet), thus a deflecting torque is developed. By the production of deflecting torque, the pointer deflects over the scale. When the moving coil instrument is connected in the circuit, the operating current flows through the coil which is mounted on the spindle. Since the coil is placed in the strong field of permanent magnets, a force is exerted on the current carrying conductors of the coil which produces deflecting torque. Thus the pointer attached to the spindle in deflected over the calibrated scale. If the current in the coil is reversed, the direction of deflecting torque will be reversed because of the field produced by the permanent magnets remains the same. 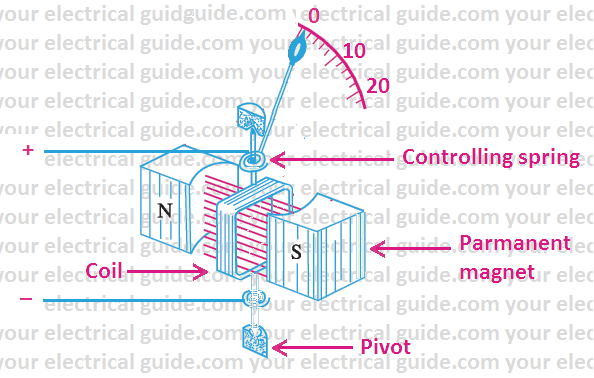 This will give a wrong direction of rotation thus the instrument cannot be used on AC, permanent magnet moving coil instruments can be used only on DC. These instruments have the uniform scale. Eddy current damping is used, no hysteresis loss as the former is of aluminum. Low power consumption because driving power is small. No effect of the stray magnetic field as working field provided by the permanent magnets is very strong. High torque/weight ratio, therefore, such instruments require small operating current. These instruments cannot be used for AC measurements. These are costlier in comparison of moving iron instruments. Friction and temperature might introduce some errors. Some errors are also caused due to the ageing of control springs and the permanent magnets. weakening of permanent magnets due to aging at temperature effects. weakening of springs due to aging and temperature effects. change of resistance of the moving coil with temperature. Magnets: In order to have permanence in magnetism, magnets are aged by heat and vibration treatment. This process results in loss of initial magnetism but that remains is strongly held. Springs: The weakening of springs with time can be reduced by careful use of material and pre-aging during manufacture. However, the effect of the weakening of springs on the performance of the instrument is opposite to that of magnets. The weakening of magnets tends to decrease the deflection for a particular value of current while the weakening of springs tends to increase the deflection. In PMMC instruments, a 1oC increase of temperature reduces the strength of springs by about 0.04 percent and reduces flux density in the air gap of the magnet by about 0.02 percent per oC. Thus the net effect on the average is to increase the deflection by about 0.02 percent per oC. Moving Coil: The moving coil of measuring instrument is usually wound with a copper wire having a temperature coefficient of 0.004/oC. When the instrument is used as a micro-ammeter or a milli-ammeter and moving coil is directly connected to the output terminals of the instruments, the indication of the instrument for a constant current would decrease by 0.04 percent per oC rise in temperature. In case of moving coil instrument, is used as a voltmeter a large series resistance of negligible temperature coefficient (made of material like manganin) is used. This eliminates the error due to temperature. This is because of copper coil forms a very small fraction of the total resistance of the instrument circuit and thus any change in its resistance has a negligible effect on the total resistance. In a situation when the instrument current range is extended by using a shunt is, however, different. The main source of error, in this case, is due to the relatively larger change in the resistance of the copper moving coil as compared to that of manganin shunt. This happens because copper has a much higher resistance temperature coefficient as compared to manganin. To reduce the error in this situation, it is usual to include in series with moving coil a ‘swamping resistance’ of manganin so that the copper coil forms only a small fraction of the total resistance comprising the coil and the additional swamping resistance. This swamping resistance is also used for the final calibration of the ammeter. Without shunt (i.e. instrument alone) 0 – 5 µA to 0 – 50 mA. With internal shunts, up to 0 – 200 A. With external shunts, up to 0 – 5000 A. Without series resistance or multiplier (i.e. instrument alone) 0 – 50 mV. With series resistance, 0 – 30,000 V.
Thanks for reading about moving coil instrument working principle. If you have any question about this topic, you can ask me in the comment section given below. © http://www.yourelectricalguide.com/ moving coil instrument working principle.